What’s It About? Imagine The Lego Movie and Deadpool got together and had a PG-rated love child. Well, they kind of did: it’s The Lego Batman Movie. 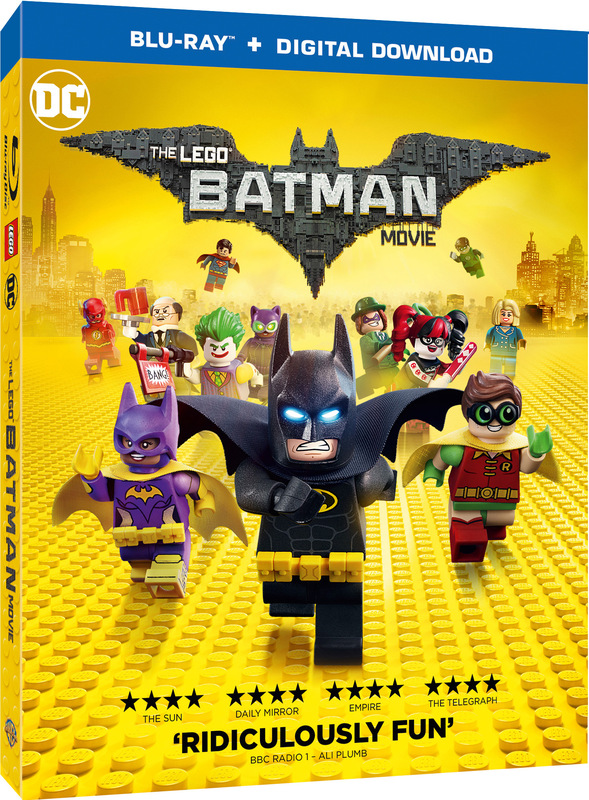 Verdict: If you’re a Batman fan, then you’ll quite likely feel you’ve died and gone to Bat-heaven when you watch the latest entry in the Lego movie franchise. With other filmic fish to fry – hello, Han Solo movie! – Lego Movie directors Phil Lord and Christopher Miller handed the directing reigns for this film over to Chris McKay, who edited and co-directed animation on the first movie. McKay’s production is a crazy, colourful, irreverent ball of energy that races through the Caped Crusader’s many and varied incarnations over the years as it spins a tale of dastardly deeds by the Joker, while weaving in a story of family and team spirit that, occasionally, veers into sentimentality. Never afraid to poke fun at itself, the Bat-legacy, movie clichés, or the movie business in general, the Lego Batman Movie channels the spirit of 2014’s super-successful Lego Movie and throws into the mix the kind of barrage of meta-gags and endless easter eggs so wickedly brought to life in Ryan Reynold’s Deadpool movie. In fact, you’ll want to watch it more than once to catch them all! And, of course, this being a Batman movie, there’s plenty of what you’d expect, including tricked-out vehicles and costumes, and explosive action. Will Arnett returns as Batman after debuting his own gravelly-voiced take on the character in the first Lego film. I loved Arnett as Gob in Arrested Development and Devon in 30 Rock, and he certainly puts his comedy chops to good use here, proving yet again that he was the right choice for the part of a preposterously pompous Dark Knight who’s in dire need of having his posturing taken down a peg or two. As for the supporting cast, Arnett’s Arrested Development co-star, Michael Cera, gives an amusingly enthusiastic performance as Batman fan-boy and side-kick Robin. While Ralph Fiennes is fantastic as Batman’s butler, Alfred. Rosario Dawson puts in a nice turn as Barbara Gordon, jumping across to the world of DC from the MCU where she’s usually found as nurse Claire Temple in Marvel’s Netflix shows. And as the voice of the Joker, Zach Galifianakis gives a perfectly serviceable performance, though it won’t stay with you the way, say, Mark Hamill’s does. On top of the main players, there’s a ton of cameos including loads of comic-book characters as well as a varied bunch of individuals from the wider world of movies and literature. Now, if you’re thinking, this movie is essentially one big ad for Lego, well, in many ways, you’re not wrong, but there’s certainly enough fun, substance, and gorgeous visuals in the film to mean it’s more than just a platter to serve up merchandise. If you’re looking for a lot of brick-building, like in the first movie, you won’t find it here, which makes sense because construction was a big part of the actual story in the Lego Movie whereas here it isn’t, and that didn’t bother me at all. Oh, and you won’t find a song either with the same level of ear-worminess as Everything Is Awesome, which, in some ways, is no bad thing. Instead, the soundtrack uses 80s pop to often comical effect and composer Lorne Balfe does a nice job integrating some rather familiar superhero themes in his score. 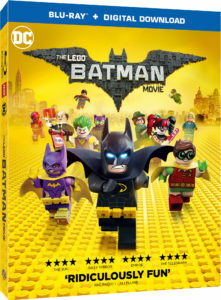 Blu-ray Extras: There are loads of amazing behind-the-scenes features to give you a real insight into the making of the movie, including Director and Crew Commentary; Deleted Scenes; Original Animation Shorts such as Dark Hoser, Batman is Just Not That Into You, Cooking with Alfred, and Movie Sound Effects: How Do They Do That? ; The Master: A LEGO Ninjago Short; Featurettes: One Brick at a Time: Making the Lego Batman Movie, Inside Wayne Manor, Brick by Brick: Making of the LEGO Batman, Behind the Brick, Me and My Mini Fig, Comic Con Panel; Rebrick Contest Winners; Film Trailers; Lego Life Trailer; Social Promos: Follow Me Online, Don’t Skip, Happy Holidays Jingle, Batsby New Year’s, and Team Cutdown. Final Words: The Lego Batman Movie does a good job continuing the entertaining franchise kick-started three years ago by Phil Lord and Chris Miller. It’s fun, often funny, silly, and crammed full of cameos, connections and easter eggs to the Caped Crusader’s world as well as the DC universe and beyond. Yes, it does sometimes indulge in sentimentality, much as its predecessor did, but there’s so much to enjoy in Chris McKay’s spin-off. The LEGO Batman Movie arrives on 4k Ultra HD, 3D, Blu-ray, DVD, & VOD on June 19 2017!